You already know I love me some Mario Badescu. 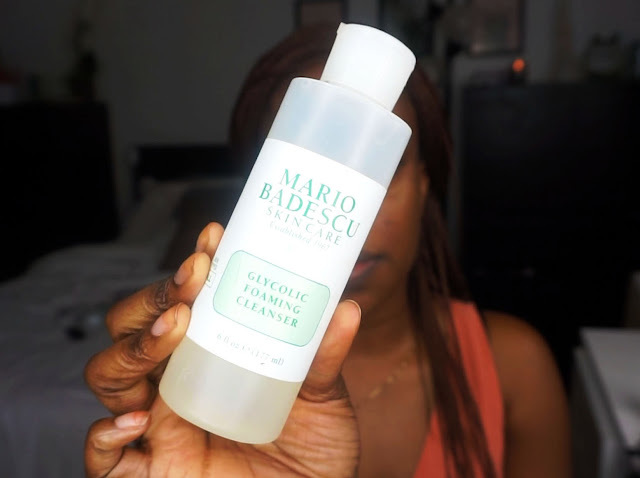 The product I am reviewing, Mario Badescu's glycolic foaming cleanser is designed to dissolve dulling dead skin cells, to help refine pores and retexturize uneven skin. This is a great exfoliating cleanser that is used 2-3 times a week and is good for all skin types. It is thick in consistency, so a little goes a long way. As you have seen in my video, it's easy to use and the results are amazing. You start seeing the results after using the product consistently for a month. It really helps to fade dark spots, retexture you skin, clean and minimize your pores. It reveals a smoother, even and younger looking skin. I used this clearer to clear my skin from acne and dark spots. I use it when I do a deep cleanse 2-3 times a week. Currently, I have some dark spots I need to get rid of, I have put it back on the shelf of products to use. I know this product works, because I have tried and tested it too many times and it always delivers results, bringing LIFE into my skin! GLOWING. I am happy with the product and firmly believe you would love it too. Ever Tried this Glycolic Foaming Cleanser by Mario Badescu?